Codependency is based on false, dysfunctional beliefs that are learned from our parents and environment. Recovery entails changing those beliefs, the most damaging of which is that we’re not worthy of love and respect – that we’re somehow inadequate, inferior, or just not enough. This is internalized shame. Last year, I published a blog, “Codependency is based on Fake Facts,” explaining the effects of this programming, which squelches our true self. Romantic love that’s mutual can for a brief time liberate our natural, true self. We get a glimpse of what it would be like to live unshackled by shame and fear―why love feels so wonderful. There are countless ways parents communicate shame―often, with just a look or body language. Some of us were shamed with criticism, told we weren’t wanted, or made to feel we were a burden. In other cases, we inferred that belief from neglect, violation of our boundaries, or dismissal of our feelings, wants, and needs. This can happen even when parents say they love us. Being codependent themselves, shame and dysfunctional parenting gets passed down unconsciously. Bad parenting can also be the result of an addiction or mental illness. Examining our thoughts and feelings provides clues to underlying beliefs. For example, when you don’t keep your body as clean as you like, are you just uncomfortable, or do you feel ashamed or disgusted. What do you say to yourself? Your thoughts might reveal a belief that it’s shameful and disgusting not to shower daily or that bodily odor or fluids are repulsive. Such beliefs indicate a general distaste and shame about the human body. When feel we should or shouldn’t do something, it may indicate a belief. “I should shower daily,” is more of a rule or standard than a belief. The underlying belief might be about the virtues of cleanliness or hygienic well-being. Another way to gain self-awareness is to notice how you judge others. We usually judge other for the same things we would judge ourselves. Beliefs also come from experiences with siblings and peers, as well as other authority figures and cultural, societal, and religious influences. In all, our beliefs are a conglomerate of other people’s opinions. Usually, they’re not based on facts, and they may be challenged. Our over-reactions to people when we’re triggered are perfect opportunities to analyze and challenge the thoughts, feelings, and the beliefs that are being activated. For example, if someone doesn’t return your call, do you feel hurt, guilty, ashamed, or angry? Do you assume they don’t like you, are angry at you, that you did something wrong, or that they’re inconsiderate? What is the story you weave, and what is the underlying belief? People won’t like me if I make a mistake. I don’t deserve love and success. My wants and needs should be sacrificed for others. I must be loved and approved of to feel okay. Other people’s opinions carry more weight than mine. Once you’ve identified your beliefs, challenge them. 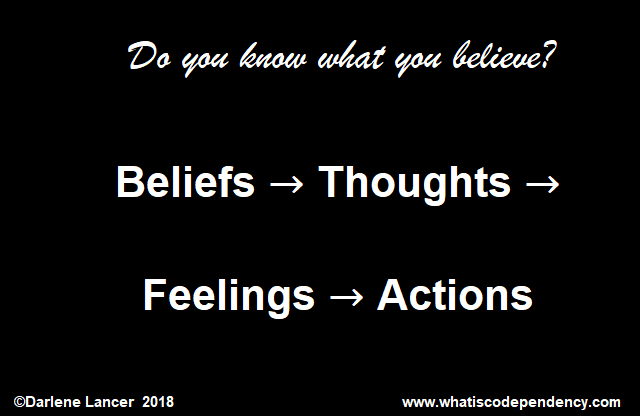 Ask yourself what evidence you have to support your beliefs and thoughts? Might you be mistaken or biased? Are you certain your interpretations of events are accurate? Check out your assumptions by asking people questions. Is there any evidence for another point-of-view? Are there instances in your experience or in the experience of others that even occasionally contradict your assumptions? Survey people to find out. Do people disagree with your conclusions? Find out. What would you say to someone else who thought and felt as you did? What would a caring friend say to you? Do you feel pressured to believe as you do? Why? Are you free to change your mind? What are the consequences of remaining rigid in your thinking? What would be the consequences of changing your mind? Think good thoughts about yourself. Notice and change how you talk to yourself. For example, instead of looking for what is wrong with you, start noticing what you like about yourself. Instead of saying, “I can’t,” say “I won’t,” or “I can.” Follow the steps in 10 Steps to Self-Esteem: The Ultimate Guide to Stop Self-Criticism and webinar, How to Raise Your Self-Esteem. Take action to do what you really want. Many codependents are sure they’ll fail and are afraid to risk. Try new things, even though you don’t believe you’re good at it! Discover you can learn and improve with practice. This is the master key that unlocks many doors. Then you know you can learn anything. That’s empowerment! Darlene Lancer is a Licensed Marriage and Family Therapist, author of Codependency for Dummies, and Conquering Shame and Codependency: 8 Steps to Freeing the True You. She's an expert in relationships, codependency, and addiction, having worked with individuals and couples for 27 years. She maintains private practice in Santa Monica, CA and coaches internationally. For more information, see http://www.whatiscodependency.com to receive a FREE Report, "14 Tips for Letting Go," and find links to her books and ebooks, including: "Dealing with a Narcissist," "How to Speak Your Mind - Become Assertive and Set Limits,""I´m Not Perfect-I´m Only Human"- How to Beat Perfectionism and "10 Steps to Self-Esteem: The Ultimate Guide to Stop Self-Criticism." Watch her Youtube, "Codependency: What It Is and What It Feels Like." How can I start freelancing as a web developer? Do Your Friends Use You As A Free Therapist? Self-Worth: Can Someone Be Made To Feel Worthless?